Let me ask you: are the words “struggling” and “suffering” really appropriate for a challenge we choose for ourselves? I often receive very long from folks who want to explain their “struggle” with diet and weight loss. But the thing is, trying to explain the struggle—without zooming out and looking at from a much wider perspective—behaviors. At the end of the day, sometimes a little perspective is needed. I have a neighbor, a very lovely lady in her early to mid 70s. I often see her walking her dog and I stop to say hello. Well, her husband of over 50 years passed away after a long illness. And then her dog, her companion of 14 years, died three days later. There was no one else in her life. That is suffering. Back east, two nice people who took in my parent’s dog now have to face brain cancer. The husband is going through chemo and has already had major brain surgery. They have no positive guaranteed outcomes, and they have been experiencing many complications. That is real-life struggle and suffering. I have a client who is facing a major challenge to his livelihood, his family business, and the only work he has known for the last few decades. Along with that, his mother has terminal cancer, and dealing with that was so much for his father to bear that the father suffered a heart attack. That is real-life struggle and suffering. This week I am dog-sitting Andy’s dog, Handsome Bob, as Andy travels back east to be with a friend. In 2012 Andy was in the wedding party for his friend as his friend took his vows to marry his high school sweetheart. Now, just 6 years later, Andy’s friend’s wife has died of brain cancer at the age of 36, leaving behind two young daughters. What Andy’s friend is experiencing and will experience for a long-time forward is struggle and suffering. There is a difference between personal lifestyle goals and the examples of struggle I mention above. 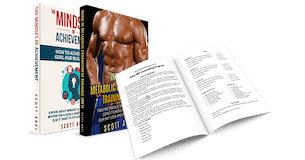 When it comes to diet, nutrition, or physique goals, the obstacls your face are not forced upon you like the struggles above are. 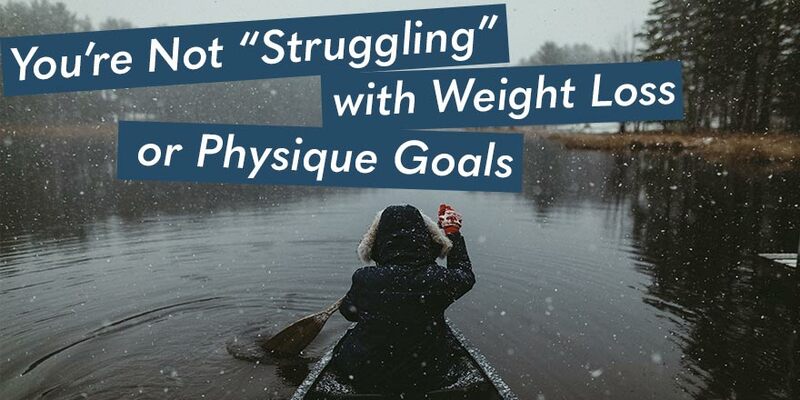 You—YOU—get to choose your fitness and weight-loss goals, and “struggle” and “suffering” have nothing to do with it! The element of choice, the fact that you’re able to choose a physique transformation or weight-loss goal, should be empowering enough. Yes, there is effort and there are some sacrifices required to “live up” to that choice, and there may indeed be obstacles—but that is what they are. There is a difference between these obstacles and actual suffering and struggle. That isn’t real-world “struggle,” and it isn’t real-world “suffering.” If you’re experiencing these things then the fact is you have chosen to inject that emotional pain into the experience. It doesn’t have to be that way. The folks in all the above examples have no choice but to face and confront their pain and suffering, and this kind of struggle calls on fortitude. Sometimes it is useful to look at the fortitude they show in the face of such struggle and apply it back to your own situation. If these people are able to face that with such bravery, isn’t it possible to face the nitty gritty obstacles that sometimes make getting in exercise and a balanced diet a bit more difficult than otherwise? “Life” may make us face real struggle and suffering, but a chosen “lifestyle” never should. Fitness as a vocation or hobby, or interest should be about personal growth; it shouldn’t be about martyrdom. Don’t let it become that.